Google’s new flagship smartphones have been hit by complaints about the quality of the screens. Tech reviewers, who have had the larger of the two devices for about a fortnight, noticed “burn in” on its display. Others noted “muddy” discolouration on the screen. Google said it was investigating the issue, which it took “very seriously”. Google’s new line, the Pixel 2 and Pixel 2 XL, are its attempt to take a bigger share of the smartphone market. Last year’s Pixel was well-received by reviewers, but sold poorly. It accounted for just 0.5% of the global market. The Pixel 2 was made by HTC, while the Pixel 2 XL was made by LG. 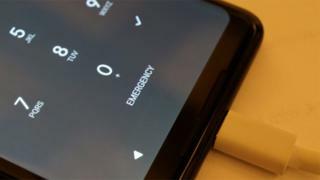 A Pixel 2 XL review unit provided to the BBC by Google suffered from mild burn-in - the term given to when a screen is permanently marked by images that have been on screen for an extended period of time. Burn-in is typical of old screens, but should not happen on a new high-end smartphone. On the Google device, the navigation bar that is often at the bottom of the screen could be seen faintly when it should not have been visible. “We take all reports of issues very seriously, and our engineers investigate quickly,” said Mario Queiroz, Google’s vice president for the Pixel range. The worst case scenario for Google would be a halt to production of the Pixel - which has already seen shipping delays of up to a month - and potentially a recall for devices already shipped. "Not a great start for sure,” said Carolina Milanesi, a Silicon Valley-based analyst for Creative Strategies. The news follows complaints over a separate Google product, the Google Home Mini voice assistant. It was discovered to have been listening in to conversations without users’ knowledge because of a faulty button. Google has since disabled the feature.